Pitcher Johnny Schmitz recorded a decade of solid left-handed success. A two-time All-Star, he was the National League’s strikeout leader in 1946. All this may pale in comparison to owning one of the greatest nicknames of his day. Source after source claims that the moniker “Bear Tracks” refers to Schmitz’s gait to the mound. “Bear tracks: I got that name in spring training in 1938 with Milwaukee of the American Association,” he writes. “In Hot Springs, Arkansas, they took a picture of me putting on my shoes sitting in the stands. They saw I had big feet. 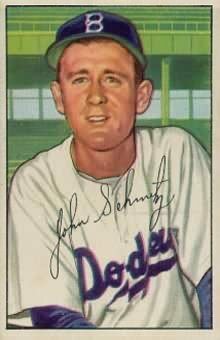 Schmitz seemed modest about his quick return to the majors in 1946, following his World War II military service. Upon sharing the tribute from Dodger hurler Rex Barney that Schmitz could drop his curve into a coffee cup (full interview from a 1996 Baseball Digest), the veteran lefty’s smile seemed to leap off the page. “I am now 89 years old, going on 90 Nov. 27. It’s my pleasure, Mr. Schmitz.